Each month we either host a speaker with well-researched credentials, or we present a mini workshop where participants go home with a project well on its way to completion. Guild meetings also feature a show-and-tell segment as well as refreshments which are provided by various guild members on a rotating basis. Guild meetings usually start at 7 pm at the Good Shepherd Church on Henderson Road in King of Prussia, PA. For directions visit the map and directions page. If you’re interested in visiting us, guests are always welcome at our general monthly meetings for a modest guest fee of $5. If you're interested in becoming a member, visit the membership page. A summary of the plans for 2019 is listed below. Please note that these are subject to change. 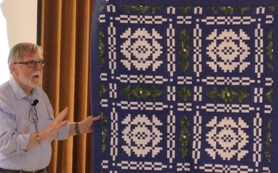 April 16, 2019 - Ann Holte: The Lancaster Diamond Quilt - Ann Holte will speak about the Lancaster Diamond Quilt, which she fell in love with and has been studying since 2009. Ann said that this quilt will remind us why we got into quilting in the first place. May 21, 2019 - Sarah Bond: These are my grandmother's Quilts - Flying geese blocks have been a favorite of quilters for generations. Sarah Bond has taken that block to new heights. By "releasing" those geese, she opened up a whole new world for those of us who love quilting. While Sarah's quilts reflect those of her grandmother, they are quite unique. December 18, 2018 - Holiday Party at 7:00 p.m.! We will enjoy appetizers and desserts. Check the December newsletter to find out what you will be bringing. We will have a member gift exchange. It has been suggested that if you want to participate in this exchange, you should spend $20 on a quilt related gift. November 20, 2018 - The awarding of the Viewers' Choice Awards. We will hear about the winning quilts and have a discussion of the quilt show. Also, did you have a chance to shop at the bou-tique? Beautiful items will still be available for you to purchase at the November meeting. October 16, 2018 - Check in quilts (three submissions per person) for the guild's Quilt Show. September 18, 2018 - Guild Quilt Challenge - Patriotic - Showing a Great Love for One's Country. Members participating in the challenge will display their quilts displayed for voting. Don't forget to read the Challenge Rules! August 21, 2018 - Ice cream social and Kelly Meanix - "How Blogging, Instagram, and Facebook Changed the Way I Quilt" (postponed from March when we cancelled because of bad weather). July 17, 2018 - Picnic followed by special presentation by Linda Hamel and Laurie Kelly from Loose Threads. Important: The meeting starts at 6 p.m.
June 19, 2018 - Cheryl Lynch will be showing her Mini Mosaics. Her Mini Mosaics burst upon the quilting scene and have generated enormous interest in her piecing technique. She has appeared with Alex Anderson and Ricky Tims on their show. May 15, 2018 - This month we are happy to welcome Cynthia England, who comes to us from Texas. Cynthia is a magnificent quilter who has introduced a new technique that she calls picture piecing. April 17, 2018 - In April Mary Molettiere will demo a project using wool. Sandy Darlington is providing the wool and the guild will provide the thread and a needle for you to use. You can bring in both paper and embroidery scissors, a small stapler, a staple remover and a willingness to learn the versatile wool applique blanket stitch and have fun. You will take home a finished project or at least almost finished. Mary is an accomplished quilter who has many other fiber art talents. March 20, 2018 - Cancelled due to snow. February 20, 2018 - Four Ways to Bind a Quilt and How to Use the Accuquilt Cutter - Four members of our guild (Cathy Fennell, Susan Glaser, Nancy Hannum, and Beth Mancini) will demo their specific technique and we will rotate around the room. In addition, Chris Candello will demo how to use the Accuquilt Cutter and some of the many dies we have for it. Think of all the quilts you can make once you make use of those dies. We have many of them, including simple ones like 2 1/2" squares. See the list of our dies on the Accuguilt page. January 16, 2018 - Cancelled due to weather. November 21, 2017 - Bethanne Nemesh presents Walk a Creative Path: Bethanne's journey as an art quilter. She will explore how her silk quilts come to be from initial sketches, painting and photography to final creations and finish details. October 16, 2017 - Guild Quilt Challenge - Color Your Quilt World: Members participating in the challenge will display their quilts displayed for voting. 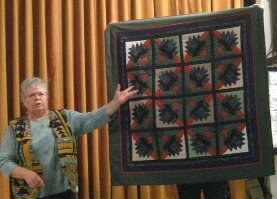 September 19, 2017 - Gyleen Fitzgerald presents Make Mine with Scraps: Focus on traditional utility quilts. Use up, cut up or recycle what you have on hand to make stunning quilts. Learn to harmonize exchange and friendship blocks or clear your clutter. August 15, 2017 - Jack Edson presents Then and Now Trunk Show: 40 Years as a quilter whose works are pieces of art. A man quilter who is unconventional partly because he was never taught to sew. Read more about him at Why Quilts Matter - Question and Answer with Jack Edson. July 18, 2017 - Ice Cream Social and Laura Cunningham presents Custom Design Your Own Quilt: how to custom design a quilting design for an actual quilt block. The lecture will take you through options of design using templates, free-motion, and other machine quilting techniques. 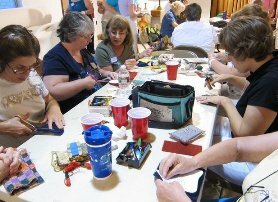 Note: Bring along a handwork project, share some new technique or class you have attended, invite a new member to your table and enjoy sewcializing with your quilting friends. All while indulging in the appetizing Annual Picnic offerings for a great night of quilting camaraderie. May 16, 2017 - Jeannie Campbell of Quilt Contrary presents Fabric Treatment. Jeannie will demonstrate a trunk show on the fun things you can do with fabric. This includes fabric twisting, iron out velvet, over dyeing, sea sponge painting, and foam and rubber stamping. Reminder: The meeting is at the Upper Merion Township building at 175 West Valley Forge Road, King of Prussia (kitty corner from our normal meeting location). We must park in the rear of the building and enter through that door. The meeting will be on the second floor in Freedom Hall and there is an elevator available for use. April 18, 2017 - Michele McLaughlin presents Storytime Stitches. The focus will be on children's quilts from the late Victorian era until the 1960s. Michele will discuss children's books, the illustrators and the cultural trends that are often reflected in the nursery. She also will demonstrate the bond between children's stories and bedtime. What is more comforting for a child than a colorful quilt, a bedtime story and a parent's hug? March 21, 2017 - In house program, using a blog by Diane Harris, 11/5/13, from Quiltmaker.com - "100 Things Every Quilter Should Do..."
Note that the originally scheduled speaker cancelled due to illness: Jan Douglas of Jan Douglas Design will speak on the topic of Quilt Design using Large Scale prints. Jan will have patterns for sale at our meeting and many items can be seen at the Lancaster AQS quilt show. February 21, 2017 - Susan Sasser, owner of The Round Bobbin, will give a preview of what's new in her shop. An opportunity to spend your Round Bobbin gift certficate if you received one. January 17, 2017 - New Members, New Friends - new members introduce themselves to the guild along with their own personal quilt trunk show. Food: Check the December newsletter to find out what food item to bring! Gift Exchange: Please bring a wrapped sewing/quilting gift, approximately $20.00 in value, to exchange if you wish to participate in the gift swap. Hold on to your gift. This years' event will be Holiday Card Match Game. November 15, 2016 - Quilt Show Wrap Up - Viewer's Choice Reveal. Color Therapy with Jacqui - Life is busy - take a moment to relax with a little Color Therapy. October 18, 2016 - Check in quilts (three submissions per person) for the guild's Quilt Show. September 20, 2016 - The Challenge - bring in your quilted items that meet the Challenge rules. August 16, 2016 - Robert Cannell presents Ergonomics and the Quilter, a program and demonstrations on how ergonomics and the quilter apply. The definition of ergonomics: A science that deals with designing and arranging things so people can use them easily, safely and effectively. July 19, 2016 - Icecream Social and speaker Storm Evans will discuss Scrap Management & Scrap Quilt Inspiration and have a trunk show. June 21, 2016 - Guild Picnic. 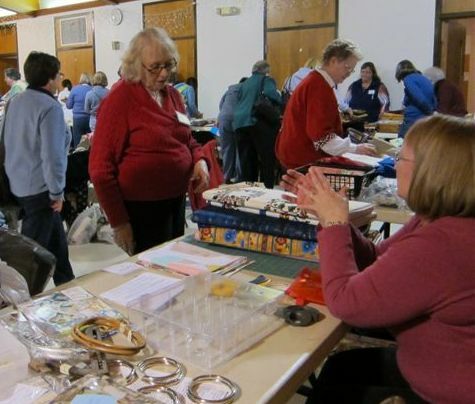 Ron and Barbara Spaulding from Pottstown Sewing will present "Something New for Featherweights" - New parts and accessories for your Featherweights and their history. May 17, 2016 - Nancy Long presents "The Fiber Art of Japan." April 19, 2016 Grace Katz has been a quilter for 20 years and a teacher at North Penn High School for Family and Consumer Sciences. 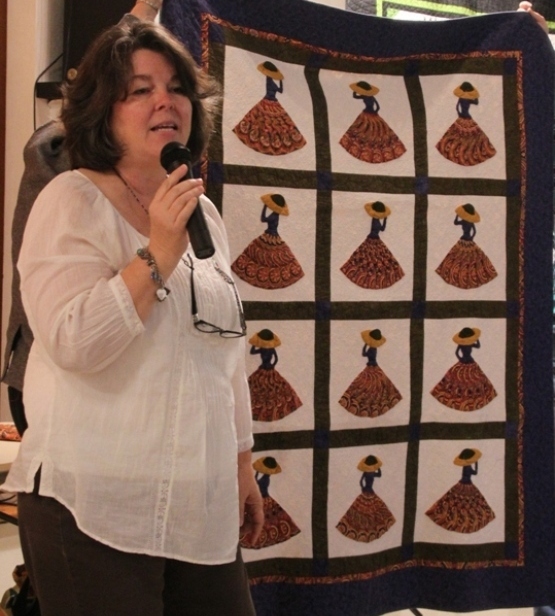 As an active member of County Line Quilters, Grace has participated in many award winning quilt shows. She is honored to present her program, "Why I Quilt, Connecting the Quilter with the Quilt." March 15, 2016 - Business meeting, discussion of quilt show venue, and Show and Tell. February 16, 2016 - Binding Tips & Techniques with Gina Shevchenko. Gina Shevchenko, long arm machine specialist from Steve's Sewing Center, will demonstrate tips and techniques to fast, easy and accurate quilt binding. Our Quilt Show is fast approaching and here is a way to brush up on finishing those quilts. January 19, 2016 - New members who have recently joined and re-joined VFHQ Guild in 2015 will have an opportunity to introduce themselves to the membership. A chance to get to know you, how you started quilting, why you joined our guild, and you may show off your latest project - finished or unfinished or something special you would like to share. December 15, 2015 - Our annual guild holiday party. Gift Exchange: Bring a wrapped sewing/quilting gift under $20.00 value. Sewing Project: We will have a small make and take project, so bring a needle, thread and small scissors to use while enjoying the company of friends. November 17, 2015 - Stacy Koehler will present "Quilting with the Feed Dogs Up". Stacy is a certified NQA judge, as is our member, Phyllis Manley. 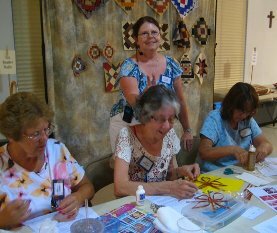 As part of Quilting Endeavors they judge quilts, teach, and lecture to serve the greater quilting community to promote the art of quilt-making. October 20, 2015 - Cynthia West and Jan Brown from The Quilt Block in Exton will have some exciting product demonstrations from Quilt Market. They will also have items from the shop to sell, so bring along your quilter's cash to purchase items that will be a "must have" for your next project and your sewing room. September 15, 2015 - The Challenge - bring in your quilted items that meet the Animal Challenge rules. Always an inspiring evening to see the creativity of our members. August 18, 2015 - Lisa Calle will give a talk on "Her quilting journey". Lisa is a long arm quilter, a teacher, and a winner of Best of Show awards at major quilt shows. Come hear how this innovative quilter has developed her quilting life. 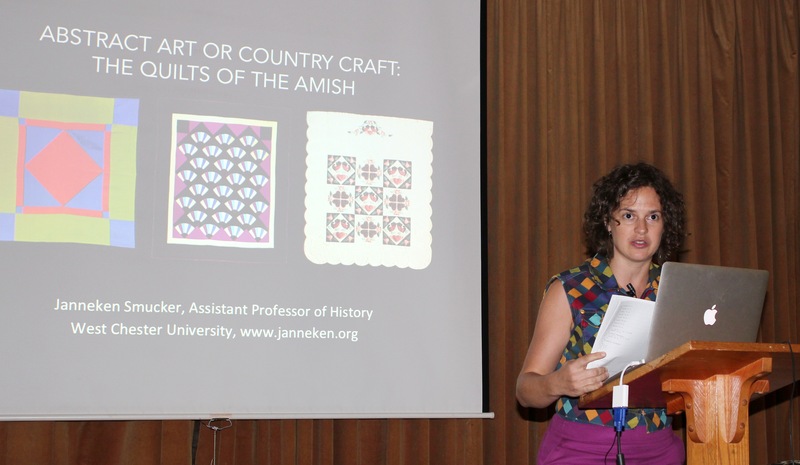 July 21, 2015 - Our Annual Ice Cream Social meets at our regular time of 7:00 p.m. Our speaker, Janneken Smuker will give a talk "Amish Quilts: Country Craft or Abstract Art". She will discuss what makes an Amish quilt Amish. Janneken is a fifth-generation Mennonite. She traces the history of Amish quilts from their use in the nineteenth century to today's current lucrative business of selling the quilts. She has written a book, "Amish Quilting: Crafting an American Icon". June 16, 2015 - Picnic and our speaker will be Sandi Blackwell. Sandi is an accomplished quilter from West Virginia. She has written three books, many patterns, and teaches a Craftsy class based on her new technique, Square-agonals. Come and learn what this is all about. May 26, 2015 - Come hear from our new members and enjoy a beautiful, inspiring Show and Tell. April 21, 2015 - Joyce Hughes is a self taught quilter and fiber artist. She designs pictorial landscape quilts using raw edge applique, thread painting and embellishments. She also likes to design one-of-a-kind handbags. She is an award winning quilter. March 17, 2015 - Our speaker, Erin Underwood, will present a trunk show and a talk "From Then to Now", showing us the good, the bad, and the "If I only knew what I was doing" quilts. January 20, 2015 – Jody Beck of Jody's Gems will talk about her journey into quilting and have a trunk show. She will have patterns for sale. Please label what you bring with ingredients that might cause an allergic reaction. If you wish to participate in the Pollyanna exchange, please bring a wrapped $15 gift. November 18, 2014 – We will learn which quilts won Viewer's Choice in our quilt show and hear the story of how they were made. October 21, 2014 – Check in quilts for the guild's Quilt Show. September 16, 2014 – The annual Challenge Revealed! Please bring your challenge quilt in a paper bag to the meeting before 6:30 so we can "secretly" hang them. August 19, 2014 – Bob DeCarli will be our speaker. His background as a math professor and engineer has led him to designing over 1,000 quilts and blocks. His new book, Remarkable Rectangles: Deceptively Simple Strip-Pieced Quilts, will be the basis of his talk. He will also have items to sell. July 15, 2014 – Icecream Social. Refreshments will be provided by the Board. We will be making wreaths. Styrofoam wreaths and pins will be provided. Other necessary supplies will be included in the July newsletter. June 17, 2014 – Our Picnic! Our speaker will be Barbara Dann of Alley Cat Quiltworks. Diva Detectives! – Become a quilt detective. How is that block made? How can I make it in a different size? How can I make small changes to my quilts for big impact? Answers to these questions and many more during this fun, lively and informative lecture and trunk show! Reminder: The meeting starts at 6 p.m.
May 20, 2014 – Jenny from Steve's Sewing Vacuum & Quilting will inform us about threads and all we can do with them. April 15, 2014 – Deb Karasik will present our program. Deb thinks outside the box in creating her contemporary quilts. She has written two books, Quilt Mavens Perfect Paper Piecing and Quilts with Attitude. March 18, 2014 – Lonni Rossi will be our speaker. Lonni has been a graphic designer for many years and has a new line of fabric to show us. December 17, 2013 – Holiday dinner and there will be a surprise guest! Important Note: Based on current weather conditions and forecasts we are going to have tonight's meeting and holiday party at 6 pm as planned. As always your personal safety is the highest priority. Please evaluate your route and local travel conditions when making your personal decision whether to come tonight. If you decide not to come tonight and have already purchased a gift, please bring it in January and there will be an opportunity to exchange gifts then. Also your gift from the guild will be saved for you in January. For the dinner, members with last names beginning A to I should bring an hors d'oeuvre; those with last name beginning J to V should bring a dessert; and those with last name beginning with W please bring a beverage. 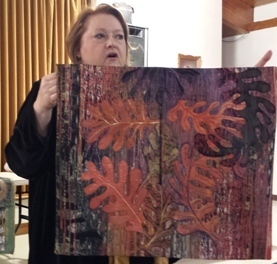 November 19, 2013 – Dawn Heefner presents "Color Me Red". Dawn will disscuss why red is so appealing, how it has been used in quilts, and red dyes through the centuries. She will share photos from Joanna Rose's famed Red and White exhibit in New York City. She will also discuss quilt care. 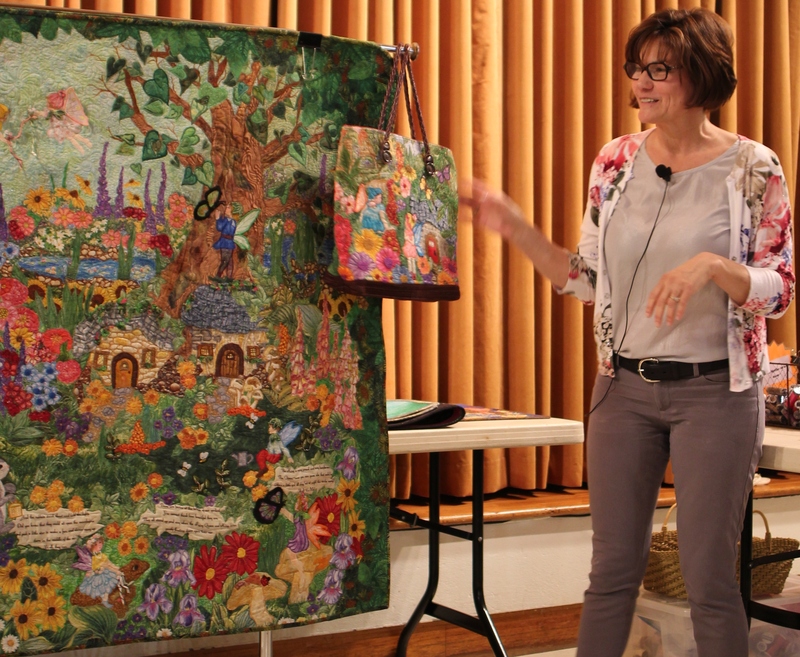 October 15, 2013 – Teresa Fusco presents A Quilter's Journey,50 and Older, Better Than Ever art quilts. Teresa is a busy outgoing artist with a passion for quilting and creating. She is an exceptionally talented, award winning quilter and a well-known teacher in the quilting industry. Teresa was born in Long Island, NY and now resides in Berks County, Pa. She has traveled and taught at quilt shows, quilt guilds, and quilt gatherings as well as other quilting events on the East Coast and Canada. She brings a fresh outlook to her classes and techniques and she encourages students to be progressive and innovative. 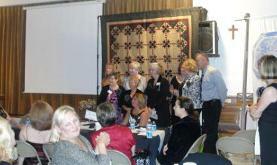 June 18, 2013 – Annual picnic and Debbie Butler Miller from Heartsdesire Quilts. 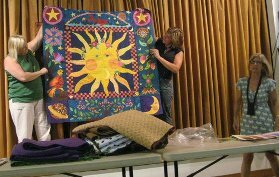 Debbie Butler Miller, Fiber Artist and instructor will offer a trunk show of some of her quilts. She will highlight her "Best Friend" Portraits. These are quilts that have been made from her patterns based on pictures of her animals. May 21, 2013 – Our program will feature two of our members. Mary Molettiere will share her secrets for successful binding. 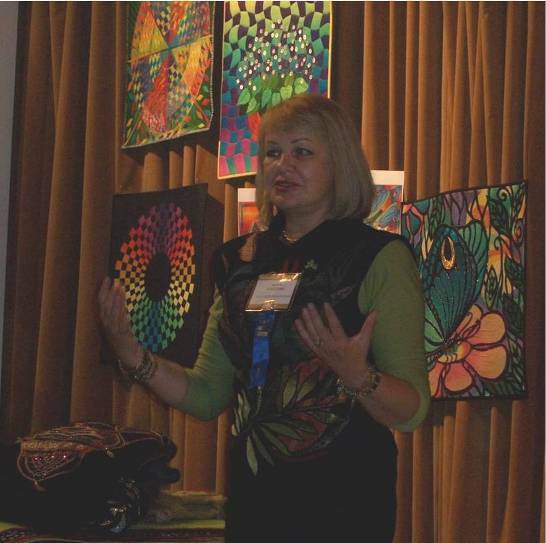 Gina Shevchenko will tell us how to get our quilts ready to take to our favorite longarm quilter. Come with your questions. April 16, 2013 – Sue Reno is an award winning fiber artist who lives and works in Lancaster County, PA. Her rich and intricate art quilts featuring landscape images, botanical subjects and local wildlife are inspired by her surroundings, incorporating plants from her extensive organic garden and from the fringes of cultivation. She also works with architectural subjects, focusing on historical buildings that are in the process of renovation. Sue will be showing her quilts and describing the process she used to make them. 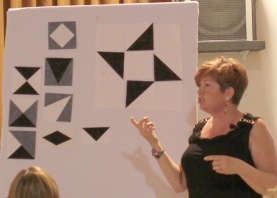 March 19, 2013 – Donna Lynn Thomas presents the Patchwork Palette lecture. After a review of some basic principles on how to combine prints, Donna will share with you her three fabric recipes that make it a simple as pie to plan beautiful fabric palettes to make into glorious quilts that are nothing like your traditional scrap quilt. 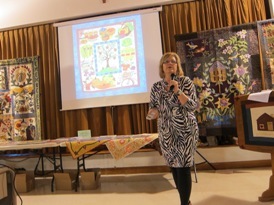 Donna will bring lots of quilts to see and to illustrate her concepts. 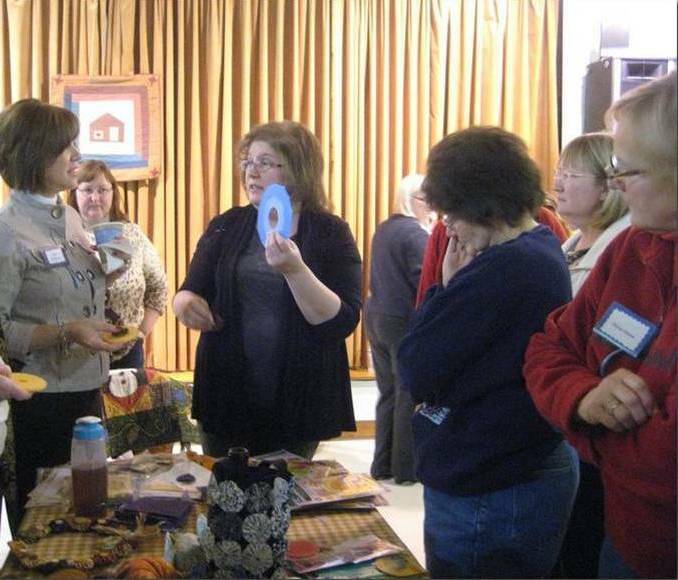 In addition to her lecture and workshop, Donna will bring her new Omnigrip On-Point ruler and associated quilts for a quick show and tell as well. There is nothing like this ruler out there and it enables us to accomplish so many things we have not been able to do with rotary cutting up until now. 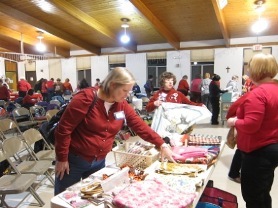 February 19, 2013 – Members' Fabric Sale with a Twist run by Donna Raymond and Chris Candello. January 15, 2013 – Lisa O'Neill, a good friend of Jackie Gauker, will be presenting on Sliver Quilts. 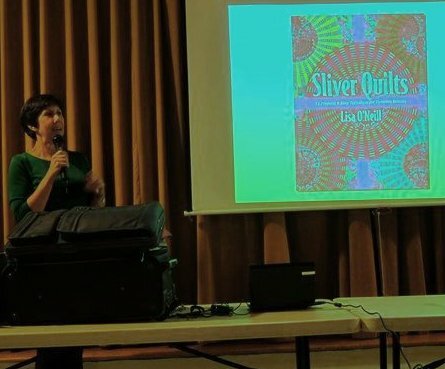 She is the author of the book "Sliver Quilts: 11 Projects Easy Technique for Dynamic Results". December 2012 – Holiday dinner and gift exchange. November 2012 – Did you see all the fabulous quilts at the quilt show? Do you know which ones won? Tonight we'll recap the highlights of the 2012 Quilt Show. 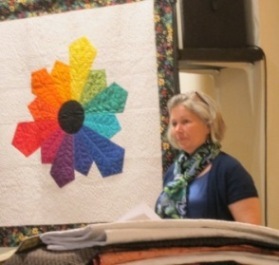 October 2012 – Check in quilts for the guild's Quilt Show. September 2012 – Silver Anniversary Celebration: You won't want to miss this delightful evening of celebration. A superb dinner, enchanting entertainment, our Silver Challenge reveal, and special gifts will await our pleasure. Reservations and payment will be taken at our May through August guild meetings as a firm number is required for catering. August 2012 – Designer Jackie Paton, of Red Rooster fabric, who will talk about being a fabric designer. This is the newest chapter of her creative career. She's still discovering how to turn an idea into a collection of fabrics. Look for a trunk show featuring her quilts. She'll also be selling items including fabric from her new line. 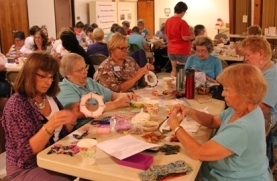 July 2012 – Ice Cream Social and wool project with Jackie, Judy, and Beth. 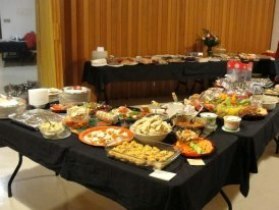 June 2012 – Annual Picnic and lecture by Pat Sloan. Pat runs her own design business called Pat Sloan & Company located in Fairfax County, Virginia. In addition to publishing her own patterns, she designs patterns for McCall's Quilting, McCall's Quick Quilts, American Patchwork & Quilting, Quilters World, Create & Decorate, and the Fons and Porter magazines. She also designed several fabric lines with P&B Textiles and Moda. 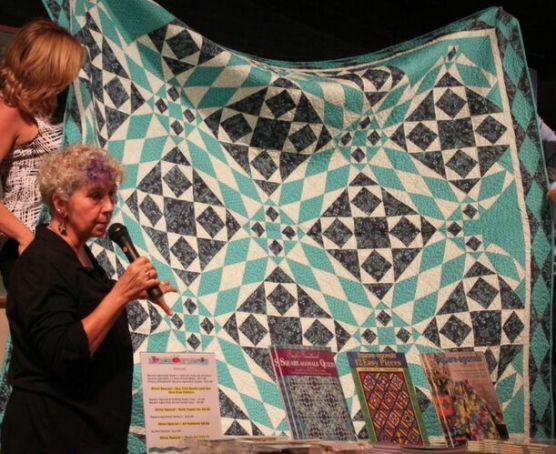 May 2012 – Meg Cox, veteran journalist and author whose writing career includes 17 years on staff at the Wall Street Journal, will present a journalist's look at today's quilt world. 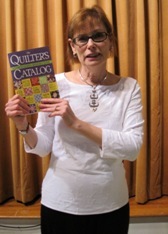 Her book, "The Quilter's Catalog: A Comprehensive Resource Guide", is a look at the modern quilt world and all its tools, techniques, teachers and trends. April 2012 – Ruler Mania: Do you love to quilt but find all the new rulers intimidating? If so, this presentation is for you. Jan and Cynthia will showcase their favorite rulers that make creating and quilting a snap. 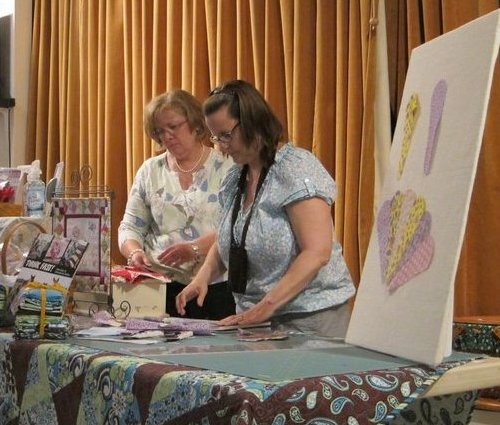 Over four years ago, Jan and Cynthia decided it might just be a good idea to open a quilt shop in the Exton area and that dream was fulfilled in August of 2007. Their boutique quilt shop, The Quilt Block, is filled with a variety of fabrics from traditional to modern. Here is a link to the Creative Grids video demos for using rulers that Jan and Cynthia shared with us. March 2012 – "Quilt As Desired..." Using lots of quilts, Michelle Scott will show the many ways you can machine quilt your completed tops. She is an award winning quilt artist who specializes in teaching, lecturing, designing and one-of-a-kind hand painted fabrics. She is also a faculty member of Quilt University, the online quilting community. Check out her website at www.piecefulquilter.com. 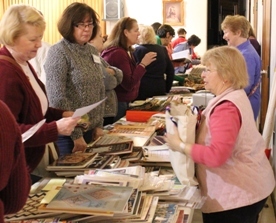 February 2012 – Members' Fabric Sale with a Twist run by Donna Raymond and Chris Candello. 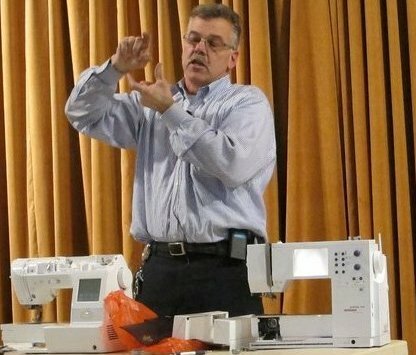 January 2012 – Our favorite, Steve Chubin, from Steve's Sewing Vacuum and Quilting, will talk about maintaining your machine and answer any questions. Are you wondering if your sewing machine could use a little cleaning before starting that next project? Not sure where to being or have a couple of questions about technique? December 2011 – This year's holiday party and gift exchange will begin at 6 p.m. This is an evening of fun and prizes and tasty food! Bring your quilting/sewing related gift (limit $15) tonight. There will be a surprise entertainer to help us pass our holiday gift. 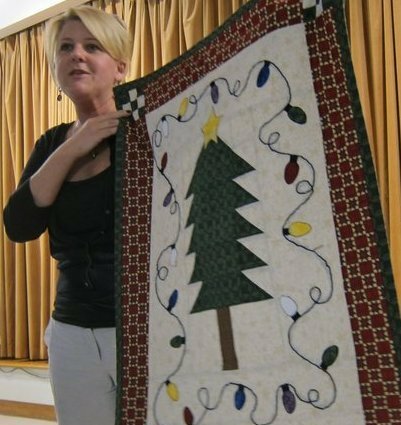 November 2011 – Round Robin of quilting skills: Sandy Darlington explains how to prepare a quilt for the longarm quilter. Jackie Gauker has a wonderful wool surprise demo...great for gift giving. 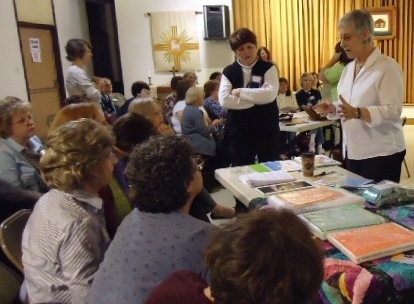 Donna LaBlanc demonstrates paper piecing. Try this technique during the meeting if you wish! See Sandy's handout Working with Your Longarm Quilter to Obtain the Best Results for Your Quilt. October 2011 – Susan Shively will be our speaker for the evening. Susan started quilting about 15 years ago. She loves to design her own patterns and can often be found doodling designs and wondering what they would look like in a quilt. She enjoys buying fabrics and loves to see which fabrics would express her designs best. To achieve the look she wants, of course, she has to buy a lot of fabric. Some fabrics and designs work, and some do not. Perhaps this would explain her large stash and UFO's. As you know, Susan has designed a special pattern for our guild members. At her workshop on October 22nd you may make any size quilt, from a table runner to a throw to a bed quilt. September 2011 – The 2010/2011 Annual Challenge Quilts will be displayed, members will vote, and ribbons will be presented. August 2011 – Pat and Arlan Christ will be the guest speakers at our August meeting. 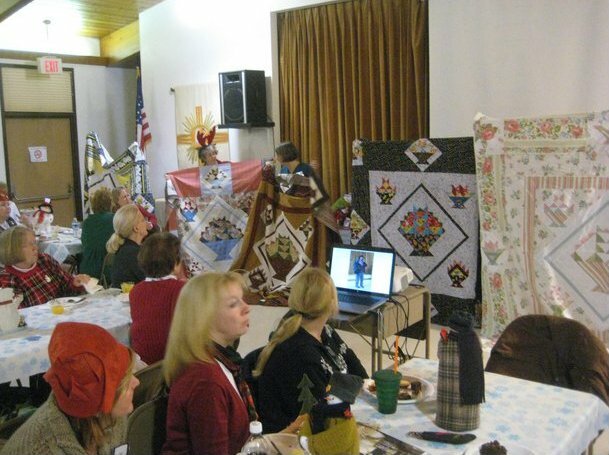 Their topic for the evening is "Pennsylvania Quilts – Folklore and Superstitions". Even if you saw Pat and Arlan Christ's quilts at Quilt Odyssey in Hershey last year, you haven't seen them all. At our guild they will show their quilts from Pennsylvania which highlight our state's folklore and superstitions. July 2011 – Ice Cream Social with Gail Kessler. Gail will explain the whole process of creating her beautiful and unique Andover fabrics from conceiving the idea to producing it on cloth. As you know, she is the owner of Ladyfingers Sewing Studio where we have spent many happy hours browsing and buying. Don't forget to bring your buying power, i.e. money, so that you may once again this month add to your shrinking stash. Ice Cream Sundaes are the treat of the evening as well, come and enjoy! 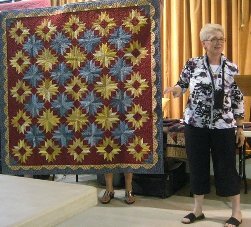 June 2011 – Enjoy our wonderful annual picnic while Nancy Bills provides a trunk show of her quilts, as well as selling fabric and patterns. 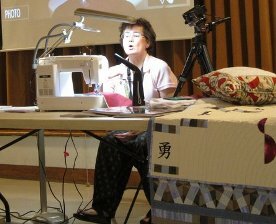 May 2011 – Fitting Techniques and Remaking Your "Too Big, Too Boxy" Art-To-Wear and Quilted Garments with Pamela Leggett of Steve's Sewing Vacuum and Quilting. 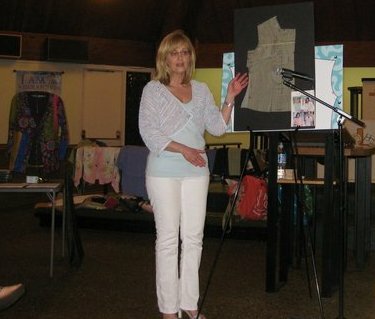 Come and learn what changes need to be made to your patterns before you make your next art-to-wear or quilted garment. Let Pamela give you the courage and knowledge to remake them into something more fitted and wearable! If you are taking the Quilted Jacket workshop, you will be measured for your custom made pattern after the lecture. We will also have the introductions of the candidates for the guild officers for 2011-2013. Remember due to Primaries, our meeting will be in the Sanctuary of the Church. April 2011 – Need a new project? We will have a follow-up to our yo-yo demo. Chris Candello, with yo-yo expert Beth Quigley, will work with us to create a table runner using yo-yos. So bring an assortment of fabric scraps ranging from 5" to 8", needle, thread, scissors, and yo-yo makers if you have them. There will be demos of making yo-yos with a template and template plastic will be available to make the size circle needed for a yo-yo. We will have yo-yo makers for sale, so bring your cash, if interested in purchasing. March 2011 – Cheryl Lynch began to quilt in earnest after a corporate career and some child rearing. It didn't take long before she started to design her own quilts. 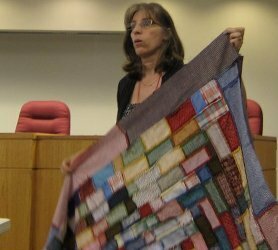 At the request of her students, she developed her own line of Judaic quilt pattern. She was fascinated by the color and texture of fabric and discovered that she could create art and folk art without knowing how to paint with a brush. Inspiration for her quilts comes from the emotions she feels for her family as well as her love of nature and cycling. Visit Cheryl's website to see some of her quilts. 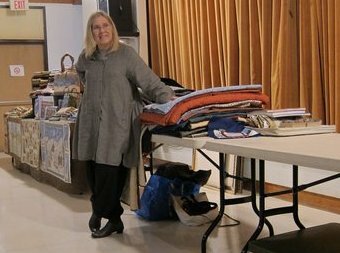 February 2011 – Get ready to enjoy a special evening featuring our yearly fabric/book/pattern sale spearheaded by Sally Rapp. As with many of the things we do in our guild, Sally also suggested having this sale, and it has been quite popular. You may sell all those fabrics, kits, etc., that you have concluded you will not use. Someone else may love the very fabric you no longer want. We also welcome our own Beth Quigley, resident yo-yo queen. Beth will teach you the technique to make easy and perfect yo-yos using Clover yo-yo templates. 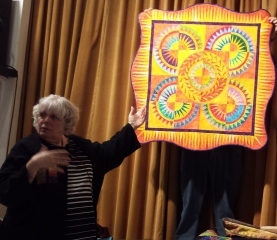 January 2011 – Nancy Cosmos' love of quilts began at an early age. In seventh grade, she pieced her first quilt, a log cabin, using all sorts of fabrics, including polyester double knits and used clothing. In 1992 she took up quilting again. Today, the Malvern resident's quilts include not only traditional bedcovers but one-of-a-kind pieces reflecting her artistic expression, embodying bold colors and textures and visual illusion. By the way, her quilts are for sale, all but the yellow log cabin quilt with rounded edges that she made with her mom in seventh grade. You will enjoy seeing this quilt artist's stunning array of quilts. December 2010 - Holiday Party. Our annual holiday party includes a gift exchange, loads of terrific food, gifts, surprises, and great fun for all. October 2010 - Quilt show preparation - Quilts collected for show. 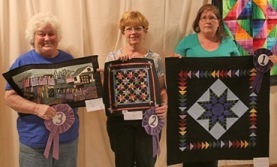 Members bring your quilt entries (which you will have previously registered by August 15th). Each quilt should be contained in a separate cloth bag (e.g., pillow case) with a label securely taped on which includes your name, and other info which will be specified a little later. September 2010 - Challenge and Annual Fabric/Book Sale. On this night, the entries for the quilt challenge will be exhibited and voted upon; and the next challenge will be announced. In addition, our fabric and book sale will offer members an opportunity to sell fabric and quilt books they no longer want and for other members to find fabric and books they’d like to have. Did you know that if pins and needles are in a wool pin cushion, they maintain their sharpness longer? This is your chance to make one in an evening. Bring basic sewing tools: needle for embroidery thread, scissors, etc. The guild will provide the wool fabric, the stuffing, and embroidery thread. June 2010 - Polly Mello - Quilts That Go Bump In the Night. This is not about Halloween quilts. It's a trunk show of quilts representing unusual events, including historical disasters. Recommended by Dawn Heefner and all of us who met Polly at Quilt Odyssey I understand there will be a rather unique, humorous presentation by Polly and Dawn. April 2010 - Didi Salvatierra - All About the Baskets. This is a trunk show featuring a variety of vintage basket quilts and blocks as well as Didi's new basket quilts. Tips and inspiration for making baskets easy. March 2010 - Linda Hahn - Margarita Madness and Other Cool Quilting Techniques. This is a machine quilting class without a machine. Using a unique technique to audition designs, attendees will draw and design along with Linda as she demonstrates numerous background, block, sashing, and border quilting designs. 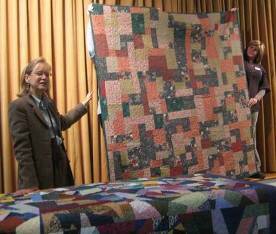 February 2010 - Jackie Gauker, of Quilters' Palette, inherited many antique quilts from her family members. She will present these to us and offer many goodies for us to purchase. 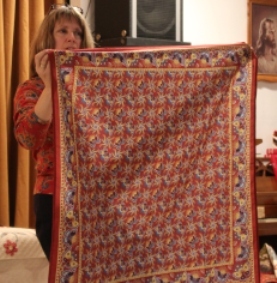 She titles her lecture "Antique Family Quilts. January 2010 - Terry Kramza, fiber artist - trunk show of her contemporary quilts and a demonstration of her unique method of assembling finished blocks to make a quilt. Recommended by Jean Hayden and Gloria Clark. Past Program: Fabric Boxes – See the Fabric box instructions.